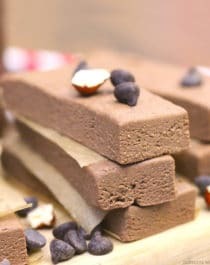 These Healthy Mo-tella Fudge DIY Protein Bars are basically like Nutella protein bars — sweet, chocolatey, and hazelnutty — but without all the junky ingredients! These are no bake, easy to make, and addictive. You’d never know they’re sugar free, gluten free, dairy free, and vegan! In an electric stand mixer bowl tted with a beater attachment, add all of the ingredients. Mix on low speed until everything is fully incorporated. Scrape down the sides of the bowl. Mix on medium speed for one last mix. Mixture should be thick and fudgy, like cookie dough. Lift the mixture out of the pan. Slice into 12 bars. Individually wrap the protein bars in plastic sandwich baggies. Store in the refrigerator for up to 1 week or stash them in the freezer. **You can buy hazelnut butter online or you can make it at home. Making nut butters at home saves a TON of money, but you do need a good food processor to do it! Keeps for ~1 week in the fridge or ~3 months in a sealed sandwich baggie in the freezer.